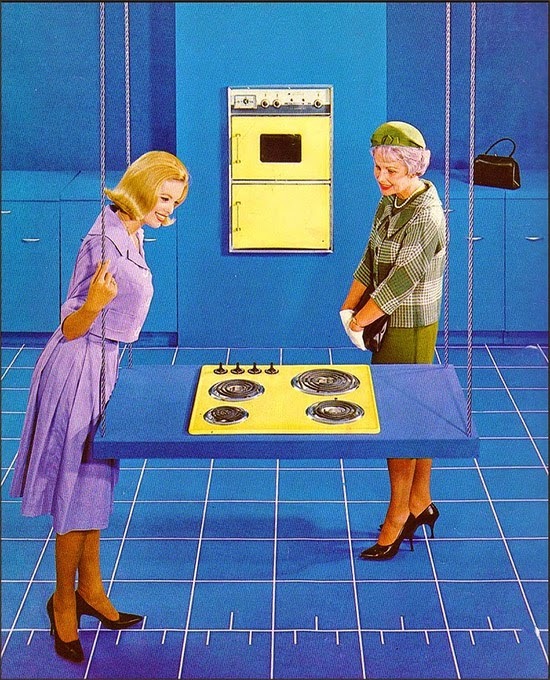 I'm afraid I can't attribute this bizarre image to a specific source; the fashions and the color of the appliances date it as being from the early 1960s. The blueprint-like flooring and floating cooktop suggest a dream kitchen in the literal sense. The ladies—mother and daughter, to be sure—are certainly enjoying their stroll through their not-yet-real room. Two particular aspects of this curious scenario catch my eye: the handbag conspicuously placed on the counter, and the uncanny resemblance of the older woman to the Queen Mother.